Polymerase chain reaction (PCR) is used to amplify or make many copies of a deoxyribonucleic acid (DNA) sequence of interest. It is used in a variety of applications such as DNA cloning, diagnosis of hereditary diseases, functional analysis of genes, paternity testing, detection of infectious diseases, and forensic sciences. The global polymerase chain reaction (PCR) consumables market was valued at around US$ 415.20 Mn in 2017 and is anticipated to expand at a CAGR of more than 4.5% from 2018 to 2026 to reach around US$ 639.89 Mn by 2026. Rise in geriatric population, increasing adoption of personalized medicine, rise in the incidence of chronic diseases, and growing awareness about disease diagnosis are some of the factors that are accelerating the growth of the polymerase chain reaction (PCR) consumables market. Over a period of time, applications of PCR consumables have increased rapidly in the areas of life sciences, health care, clinical research, pharmaceuticals, and food & beverage. Technological advancements have been made to meet specific requirements for the amplification of desired biological components from the sample solutions and to improve overall throughput time and work efficiency of laboratories. Developments in the molecular diagnostic technology, fueled by the need for fast, accurate diagnosis for patients and doctors in the ever-evolving health care industry, are boosting the polymerase chain reaction (PCR) consumables market. Identification of genomic differences to predict drug resistance or drug response by patients could offer scope to design a therapy tailored to the specific characteristics of a particular type of cancer. The understanding and exploration of cancer cells through PCR technology is expected to help in developing targeted therapy and personalized, preventive, and therapeutic solutions for different types of cancer. According to the WHO, approximately 35.3 million people were diagnosed with HIV and approximately 1.6 million people died of AIDS in 2012. Moreover, according to the Centers for Disease Control and Prevention (CDC), approximately 50,000 individuals are diagnosed with HIV in the U.S. each year. PCR has enabled the identification of pathogens within a short span of time and has played a pivotal role in the management of various chronic viral infections. The polymerase chain reaction (PCR) consumables market has been segmented based on product, distribution channel, and region. In terms of product, the PCR tubes segment is estimated to account for a large share of the market. PCR has transformed disciplines from forensics to food safety and clinical diagnostics to genomics in the last two decades. There is potential for future development of the technology. R&D would boost market expansion and create new avenues for revenue generation, as was demonstrated in the past with qPCR. One of the newest developments in the use of PCR technology in molecular diagnostics is the polymerase chain reaction-enzyme linked immunosorbent assay (PCR-ELISA), an advanced immune-detection method. Based on distribution channel, the research and academic institutes segment constituted a major share of the market in 2017. The segment is likely to expand at a considerable growth rate as compared to other distribution channel segments during the forecast period. The polymerase chain reaction (PCR) consumables market has expanded at a rapid pace in the past few years, mainly due to increasing participation of public research organizations. Rise in government and private funding for research and investments in R&D by biotechnology companies is expected to drive the research and academic institutes segment. In terms of region, the global polymerase chain reaction (PCR) consumables market has been categorized into North America, Europe, Asia Pacific, Latin America, and Middle East & Africa. Developed regions such as North America and Europe accounted for a leading share of the global polymerase chain reaction (PCR) consumables market in 2017. The large base of biopharmaceutical companies and research and academic institutes in these regions has contributed to the leading share of these regions. Moreover, rapid expansion and increase in number of research and academic institutes in these regions are expected to propel demand for polymerase chain reaction (PCR) consumables during the forecast period. The market in Asia Pacific is projected to expand at an exponential growth rate, owing rapidly improving health care facilities in countries such as India, China, South Korea, and Malaysia. Japan dominated the polymerase chain reaction (PCR) consumables market in Asia Pacific, whereas the market in China is anticipated to record significant growth during the forecast period. Also, increase in investment by leading clinical diagnostic labs and hospitals providers is expected to fuel the market in the region. These factors are likely to drive demand for polymerase chain reaction (PCR) consumables in the near future. The market in Latin America and Middle East & Africa is projected to maintain a steady growth rate during the forecast period. Prominent players in the global polymerase chain reaction (PCR) consumables market include Bio-Rad Laboratories, Inc., Hoffmann-La Roche Ltd., Inc., Thermo Fisher Scientific Inc., Qiagen N.V., Merck KGaA, Agilent Technologies, Inc., Eppendorf Group, 4titude, Corning Incorporated, and Greiner Bio-One International GmbH. This report on the global polymerase chain reaction (PCR) consumables market analyzes the current and future prospects of the market. The report comprises a comprehensive executive summary, including a market snapshot that provides overall information of various segments. The research is a combination of primary and secondary research. Primary research formed the bulk of our research efforts along with information collected from telephonic interviews and interactions via e-mails. Secondary research involved study of company websites, annual reports, press releases, stock analysis presentations, and various international and national databases. The report provides market size in terms of US$ Mn for each segment for the period from 2016 to 2026, considering the macro and micro environmental factors. Growth rates for each segment within the global polymerase chain reaction (PCR) consumables market have been determined after a thorough analysis of past trends, demographics, future trends, technological developments, and regulatory requirements. A detailed qualitative analysis of factors responsible for driving and restraining market growth and future opportunities has been provided in the market overview section. The report also provides insights into the key trends of the polymerase chain reaction (PCR) consumables market such as increasing industrial applications of PCR and penetration in untapped markets. Key market indicators influencing the global polymerase chain reaction (PCR) consumables market, including cost constraints and regulatory landscape, have been taken into consideration.. The report also includes market attractiveness analysis of the major segments that provides a thorough analysis of the overall competitive scenario in the global polymerase chain reaction (PCR) consumables market. The report also includes Porter’s five forces analysis of the global polymerase chain reaction (PCR) consumables industry. Market revenue in terms of US$ Mn for the period between 2016 and 2026 along with the compound annual growth rate (CAGR %) from 2018 to 2026 are provided for all the segments, considering 2017 as the base year. The year-on-year growth of the global polymerase chain reaction (PCR) consumables market for each segment is also reflected. Additionally, market- related factors such as rise in demand for advanced molecular diagnostics, rapid growth of the life sciences industry, development of new tests, increase in awareness about molecular diagnostics, and historical year-on-year growth have been taken into consideration while estimating the market size. Based on product, the global polymerase chain reaction (PCR) consumables market has been segmented into PCR tubes, PCR microplates, caps/lids, and others. In terms of end-user, the market has been classified into research and academic institutes, clinical diagnostic labs and hospitals, pharmaceutical and biotechnology companies, and others. The research and academic institutes segment is expected to remain dominant during the forecast period. 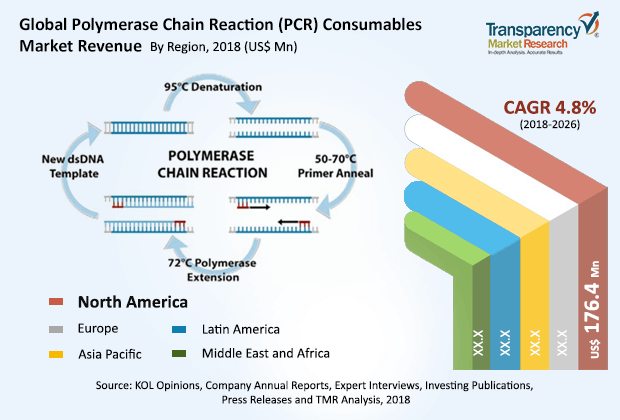 In terms of region, the global polymerase chain reaction (PCR) consumables market has been categorized into North America, Europe, Asia Pacific, Latin America, and Middle East & Africa. In addition, the regions have been further segmented into major countries in each of the regions. These include the U.S., Canada, the U.K., Germany, France, Italy, Spain, China, Australia, Japan, India, Brazil, GCC, South Africa, and Mexico. The report also profiles major players in the polymerase chain reaction (PCR) consumables market based on various attributes such as company overview, financial overview, SWOT analysis, key business strategies, product portfolio, and recent developments. Key companies profiled in the report include Bio-Rad Laboratories, Inc., F. Hoffmann-La Roche Ltd., Thermo Fisher Scientific Inc., Qiagen N.V., Merck KGaA, Agilent Technologies, Inc., Eppendorf Group, 4titude, Corning Incorporated, and Greiner Bio-One International GmbH.